On December 31st, 2009, the United States had a total public debt outstanding of $12,311,349,677,512.03. Less than 3 1/2 months later, and this number has swelled to $12,826,379,456,286.85. By the end of this fiscal year, the United States is expected to have about $14 trillion in total public debt. In the last 100 calendar days, the United States has managed to add half a trillion dollars to its national outstanding debt total. This works out to $5 billion PER DAY in new debt. To put this into perspective, the United States currently has a population of around 307 million people. Every man, woman and child in the country has seen their share of the national debt climb by $1,666.67 in just the first 3 1/2 months of 2010. This works out to around $16.70 per day, which doesn't sound too terrible until you realize that this is $16.70 per day multiplied by 307 million. "Debt held by the public" has climbed from around $7.8 trillion to $8.37 trillion from the end of December until April 13th. "Debt held by the public" is money that has been borrowed from foreign governments (such as China), hedge funds, pension funds, foreign investors, American investors, etc. Servicing this debt is expensive, and is only going to get more expensive if interest rates trend higher. "Intragovernmental holdings", which is money that the US government has borrowed from certain government programs (such as Social Security), has fallen from $4.5 trillion to around $4.48 trillion since the start of the year. As of this instant, every man, woman and child in the United States owes $42,214 for their share of the national debt. By this time next year, this number should be around $46,666. 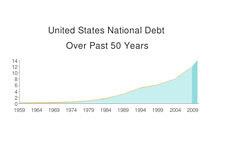 A few more numbers for you - from December 31st, 2009 to April 13th, 2010, the United States added roughly around $500 billion to its total debt load. From September 30th, 1996 to September 30th, 2001, the United States added roughly $600 billion to its total debt load ($5.2 trillion to $5.8 trillion). Sure, the US has undergone a shock to its system over the past couple of years that has forced it to run trillion dollar deficits. However, this fact won't make the money any less easier to repay.